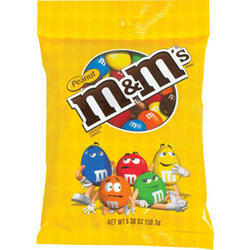 M&M Peanut Peg Pack 5.3 oz. A nice little bulk pack, Just about perfect to fill a little bowl for everyone to have M & M Peanut Candies to share. NOTE: This is a bulk pack, not a bag full of "fun size". There is just one bag full of M&M Peanuts.